The Hallowig – Knitty has a fairly easy pattern for a knitted wig made with brightly-colored yarn. Memorial Molar Ring – Odd memento mori-ish sort of ring made with vintage porcelain molars. California Carnivores – Huge retail carnivorous plant nursery. In addition to selling lots of interesting varieties, the site is a great learning resource. Nessie Ladle – I love the way the long neck of this ladle peers out of your soup at you. Viral Fear – A roundup of creepy urban legends which have been spread by the internet. The Devil’s Bible – The 13th-Century Codex Gigas has been scanned by the World Digital Library and is available online. It’s primarily text, but there are some pretty illuminations. A National Geographic documentary about the manuscript is here. Improbable Island – Elaborate text-adventure game in which you are charged with destroying a leaking Improbability Device. Be sure to check out the rookie guide. Housepig – Lots of vintage movie posters, including a lot of horror movies. Nutter Butter Bats – Super-easy “bats” made using peanut-shaped cookies. Cthupid – Just in time for Valentine’s Day, these Cthulhoid Cupids will surely win your sweetie’s heart. Or rip it out. One of those. 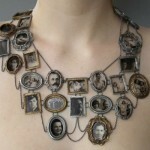 Artist Ashley Gilreath made this lovely portrait necklace, entitled, “I Am Who They Were,” featuring photos of various ancestors. There are several additional views in the Reliquaries section of her portfolio (scroll down toward the bottom). This is a really striking piece and would be a great way to showcase photos of people who were important to you. 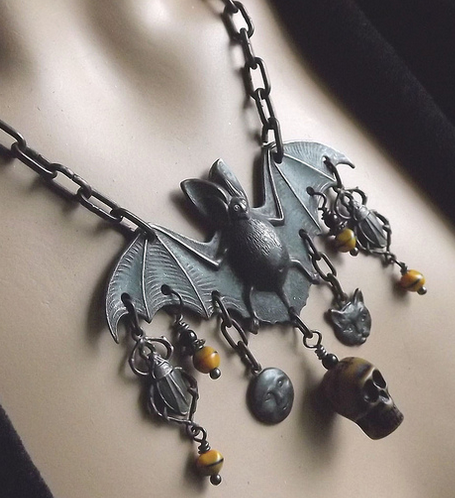 A “family tree” one featuring notable ancestors would be a thoughtful gift for someone interested in genealogy, and a necklace with thumbnails of goth icons–anyone from Poe to Siouxsie Sioux–would be a very unique accessory. If you’ve got photos languishing in a drawer, it’s time to dig them out and turn them into a conversation piece. It’s time for another bunch of random stuff that I want to share but can’t hang a whole post on. As a pleasant change, I’ve actually got attributions for all of the images this time. Yay. The fabulous Dead Spider posted this on her site without comment. 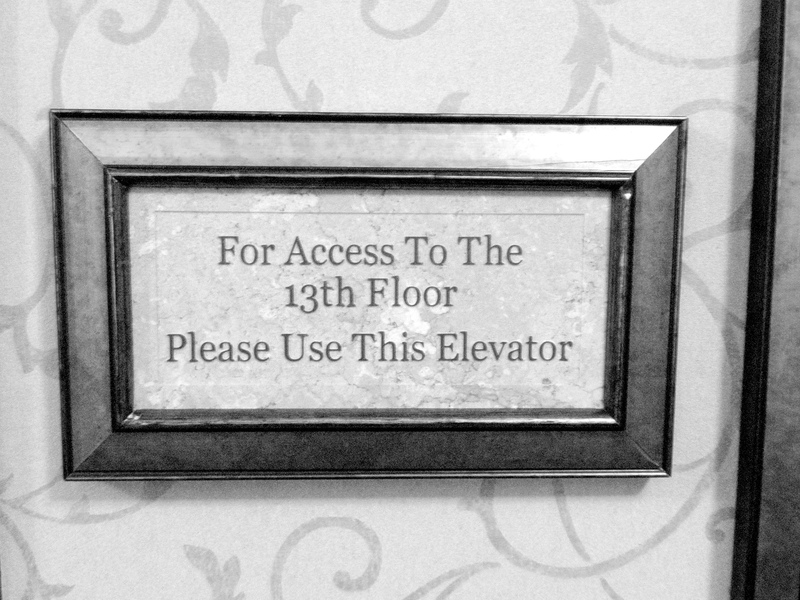 It would be perfect to hang on a closet or bathroom door. 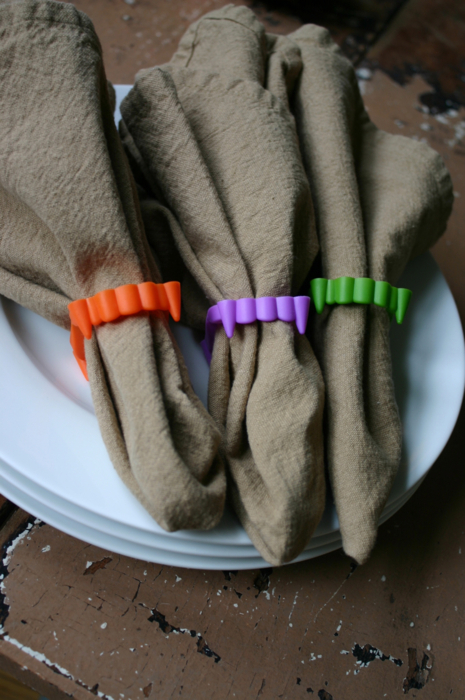 This idea by Family Chic is such a great use of brightly-colored plastic fangs. 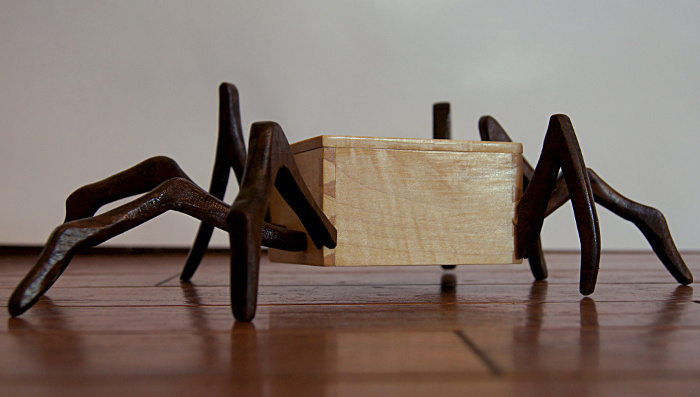 Woodworker going to pieces makes cool wooden boxes with spidery legs. There are more examples in his gallery. 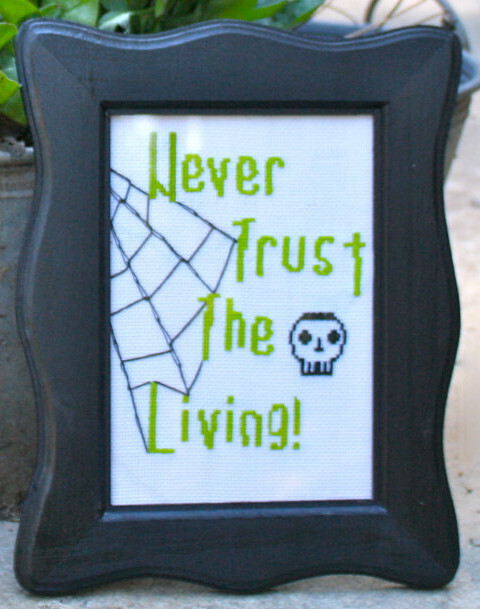 This cute cross-stitched Beetlejuice quote is by Etsy seller CinemaStitches, who has several other amusing ones as well. 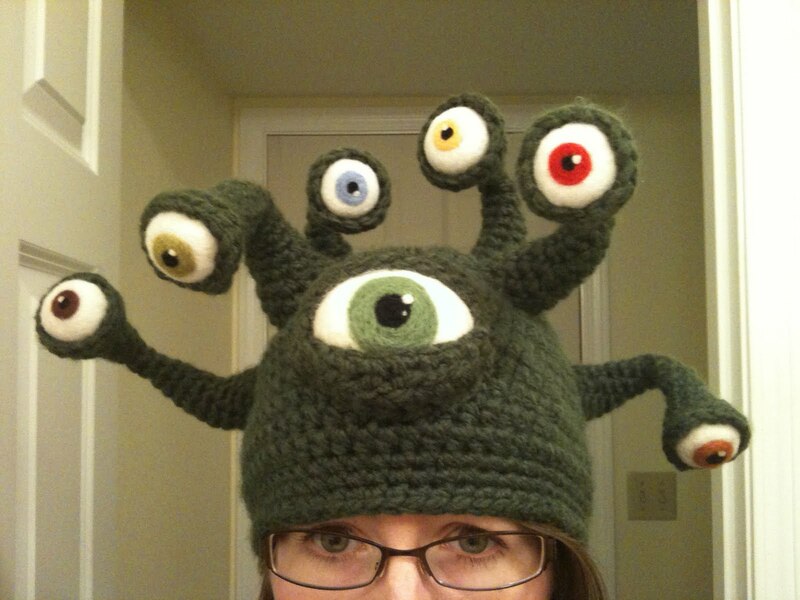 Jen of Twist & Loop made this awesome “beholder” hat with needle-felted eyes for a craft contest. Sadly, despite much begging in the comments, she doesn’t have a pattern available and won’t take commissions. This would be a great way to use up scrap fabric, or to showcase favorite band T-shirts. 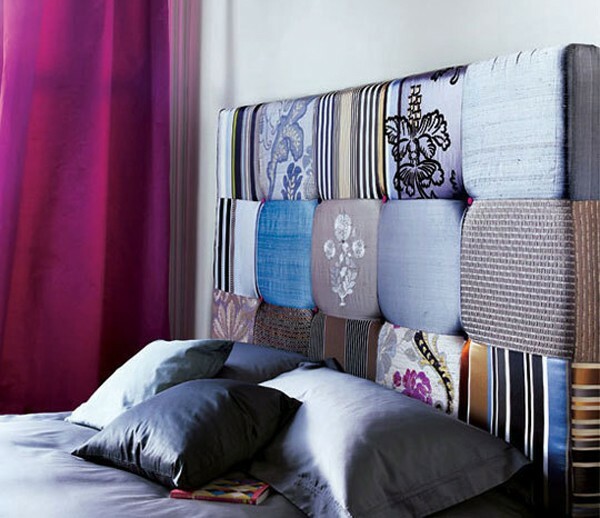 There are instructions for making a similar headboard here. 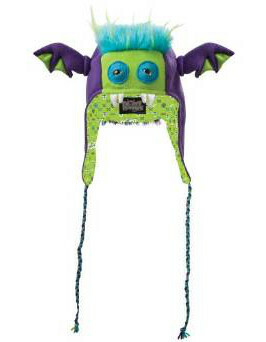 A whole line of silly fleece hats, including horned Viking helmets and several different monsters (the one pictured is named Bumblezor). 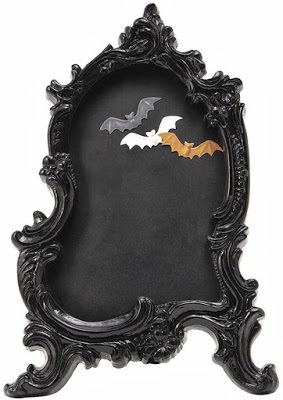 Available from Houzz, it would probably be possible to DIY something similar using an interesting picture frame and chalkboard paint, but I love that this one comes with bat-shaped magnets. 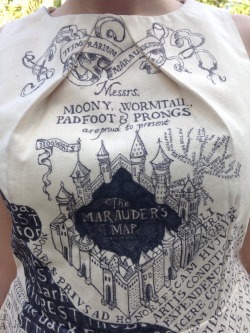 Ali of permets-tu drew the Maurauder’s Map on a dress to wear to Leakycon. There are no build notes, but she commented that she never wanted to use another fine-point Sharpie in her life, so I’m guessing it was just a stencil and a whole lotta work. Zombies love me cause I’ve been marinating my brain in wine for years. Edgar Allan Poe in the sheets. Helena Bonham Carter and Tim Burton didn’t split up — they just finally got untangled. GHOSTS TO STOP KISSING US IN OUR SLEEP! Probably a fun thing to tweet would be “going to meet a guy I met on Craig’s List” and then never tweeting again. If I were a skeleton, my only pickup line would be “Wanna bone?” Why try harder? In the mid-1960s Disney released Chilling, Thrilling Sounds of the Haunted House, an LP album composed mainly of sound effects collected by the Walt Disney Studios sound effects department. Despite the title, its only relationship to the Haunted Mansion attraction was that some of the sounds were eventually used in various places during the ride. Side 1 consisted of ten vignettes narrated by voice actress Laura Olsher (including one track called “Chinese Water Torture” which today is remarkable mainly for its cultural insensitivity); the second side contained a variety of sound effects intended for use in creating one’s own stories. YouTube user doctordel has kindly uploaded the entire album. If you, like me, were scarred impressed by this album as a child, prepare for a stroll down memory lane. Adagio Teas – Sells “fandoms samplers” with collections referencing “Welcome to Night Vale,” Doctor Who, Lord of the Rings, and lots more. Jewelry Made from Fake Food – Wearable items made from realistic-looking fake food. I like the bacon brooch. Free Crochet Skull Patterns – Roundup of patterns from various sources. Mage Studio – Jewelry and accessories made from pretty D&D dice. Victorian Cliff House – Some old photos of a very precariously-perched, but completely gothy and awesome, mansion in San Francisco. It looks like there’s a restaurant there now. Poop. KISS Garden Gnomes – I like this makeover much better than the zombie ones. Fairy Godmother Cabinet – Assemblage artwork made for a “fairy godmother” swap. Choi Xoo Ang – Artist who creates surreal, really creepy, sculptures. NSFW-ish. Croshame – Hey, neat; I didn’t know these guys had an Etsy shop. Lots of weird little amigurumi like Baphomet and Sid & Nancy. Cobra Cake – Despite its intricate appearance this loooong cake is made of halved bundt cakes and Rice Krispie treats, so it’s actually fairly DIY-able. 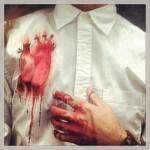 Just in time for Valentine’s Day, BoifromIpanema has a great tutorial for adding a bloody anatomical heart to a shirt or blouse. His instructions begin, “draw an anatomical heart onto the front of your shirt,” which means that his artistic skills are significantly greater than my own. If you’re in the same boat, just find an image of a heart that you like and transfer it onto the fabric. Searching Google Images for “anatomical heart outline” returns a lot of simplified drawings that are suitable for tracing, and Home Stories A to Z has a roundup of various methods for transferring images; choose whichever one looks easiest. The rest of the process is pretty straightforward, painting the heart with dye and letting it spread a little. The tutorial suggests using tie-dye resist to prevent the dye from spreading too much, but you could probably omit that step; the heart should look fine surrounded with a little seeping blood. This is an amusing antidote to the sugary-sweet imagery you usually see on Valentine’s Day. Give a shirt to your sweetie, gift friends with a matching pair, or wear one yourself to make strangers vaguely nervous. Unlike tabletop role-playing games where the players roll dice and move miniatures, the players in LARPs act out their characters’ moves. Last month, 180 LARPers gathered at a 13th-Century castle in Poland to spend a weekend as students at Hogwarts. The College of Wizardry LARP was an “unofficial” big-budget adventure organized by RollespilsFabrikken and Liveform, assisted by local Polish players. Earlier this month, 180 players from 12 countries (including the United States) came to Czocha Castle to enter the world of Harry Potter. Armed with wands and wizarding robes, textbooks and potion bottles, these live action role-players came to Czocha to live out their dream of entering the wizarding world and experiencing, if only for one weekend, what would have happened if that owl had shown up to whisk them away from the muggle world forever. There’s also a longer followup documentary here, and Kill Screen wrote about the experience. The game was supposed to be a one-shot event, but response was so enthusiastic that they’ve got two additional ones planned for April 2015: One a sequel for participants of the first game and the other for new participants. The sites for the LARP teams involved, RollespilsFabrikken (all Danish) and LiveForm (which has an English version of the site) both have loads of other interesting-looking past games which might serve as resources for homebrew events. Like any self-respecting goth, you’ve probably got leftover scraps of velvet lying around that you aren’t sure what to do with. The Lemonista has an easy tutorial for making attractive velvet pumpkins in a variety of sizes. The tutorial uses real dried pumpkin stems, which add an interesting rustic touch. If you or a friend grows pumpkins or other squash in your garden, you can save the stems after harvest. It might also be possible to find long-stemmed squash at the grocery store, and (obviously) you can save the stems from jack-o’-lanterns after Halloween. Make sure they’re completely dry before you use them, lest they mold: Just leave them in a warm, dry spot for a week or so. If you don’t want to use real stems–some of them have teensy spines that might be unpleasant–or you don’t want to wait to collect them, you can make fake stems. anderson + grant has a method for making surprisingly realistic-looking stems; An Extraordinary Day‘s “book pumpkin” tutorial includes easy instructions for making stems with a twig and hot glue. The Lemonista’s tutorial suggests filling the pumpkins with a mixture of dried beans and fiberfill; you could also use poly pellets or similar filler beads. These pumpkins are so easy to make that you could turn out a lot of them in a couple of hours. They look great grouped in a bowl or arranged on a mantlepiece. They’d also make cute placecards which could double as a party favor.